An old offensive favorite in youth football is the Split Wing Left 36 HB Cross Buck Counter play. It is #9 on my 10 best youth football offensive play list. I really love misdirection plays in youth football. It’s very hard to keep your defensive ends and corner backs to play contain on regular plays, and counter plays make it even tougher on them and over pursuing linebackers. If you are playing a team that runs a lot of misdirection you better teach your D-backs and LBs to sink on their first step otherwise you might be in for a long day. 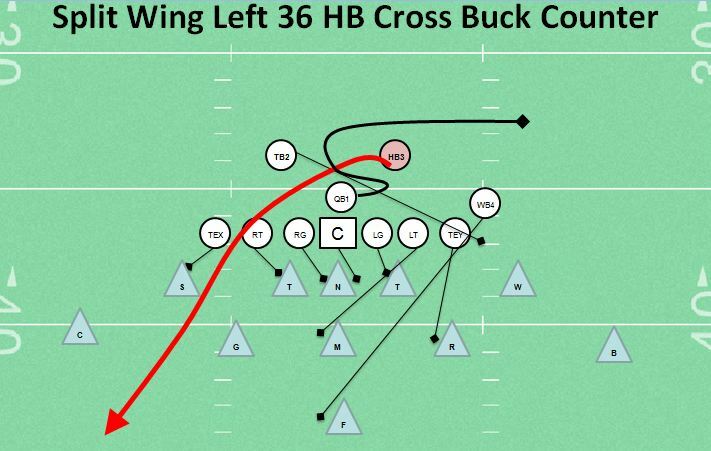 The HB cross buck is a standard play in many youth offense playbooks and pro play books. You set the play up by running lead dives with your two running backs and then hit them with the cross buck. The blocking is fairly simple. I am running against a 5-3 defense in the above play diagram and running a BB Split blocking at the hole with some backside downfield blocks on LBs and DBs. You can adjust your blocking for your opponent’s defensive scheme. The QBs footwork can be a little tricky at first but this just takes reps. I usually have the QB open backside and faking to the TB crossing between QB and HB3. Then the QB will spin toward playside and hand the ball off to the HB3. After the handoff, the QB then fakes a backside QB keeper deep. The HB3 hesitates a step to let the other back clear and receive the handoff from the quarterback. The HB3 should run underneath the TE block on the DE and run the ladder to the sideline and end zone. If you are playing a defense with very aggressive LBs and inside d-lineman then this counter play will work wonders. Not only will it gain big yards but your other plays will also start working because the defense must respect you counter and not jump on every play. As a defensive coordinator I hate this play. It is very tough to defend if you are not stuffing the hole on every play. There are many variations of this cross buck play. If you like it too and or have a variation, please leave a comment. I would love to hear from you. Let me know what you think. Great Job Coach- Love this Blog, and Love the Content- We still have a game left so we can’t comment what our “Favorite” plays are – but I haven’t seen a better explanation of this play for youth football. Play for fun, and winning is funner ! Here’s a Variation for everyone: After a scrape block, release the Backside end (tight or slot ) to the secondary- that END can wreak havoc if this play starts to gain larger yards, and if all goes well, neutralize the Backside safety- and create the last cutback lane for 6 points..
After that, you can create a play action Pass: release that 2Back ( after scrape block ) to the backside flat, 4 back across short, and you already have the end moving for a quick skinny post. QB has to get rid of this fast- double fake play action….